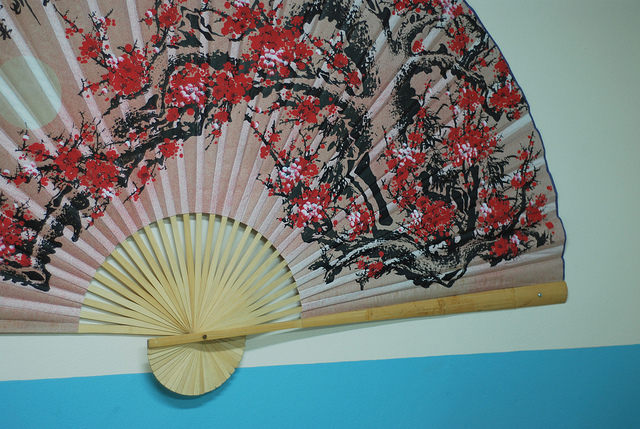 Yes, Chinese! As you may know, I recently started a Mandarin Chinese course. It’s enjoyable but also pretty difficult! My teacher is nice and patient, and the materials she’s given us are good, but I’ve also been searching around for some additional resources to help me learn. I found a few sites on the internet and I thought I’d mention them here, in case any of you are interested. Best of all, they’re all FREE! Additionally, if you know Chinese or someone who speaks it, and you have any tips or resource suggestions for me, I’d love to hear them! This is a series of videos done by a Chinese teacher named Mike. The style is a bit goofy at times (it’s shot in his garage and he tends to wear strange shirts, hats, and/or sunglasses), but he seems to genuinely know what he’s talking about when he teaches. He’s able to make the 10-minute video lessons interesting and entertaining, and he does a good job explaining details about the language. The best part is each video also has a transcript you can download, and together the transcripts form chapters of a book. 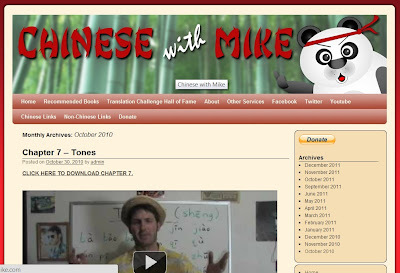 Especially considering that it’s a free site, Chinese With Mike is a pretty great resource for people wanting to start learning Chinese on their own. 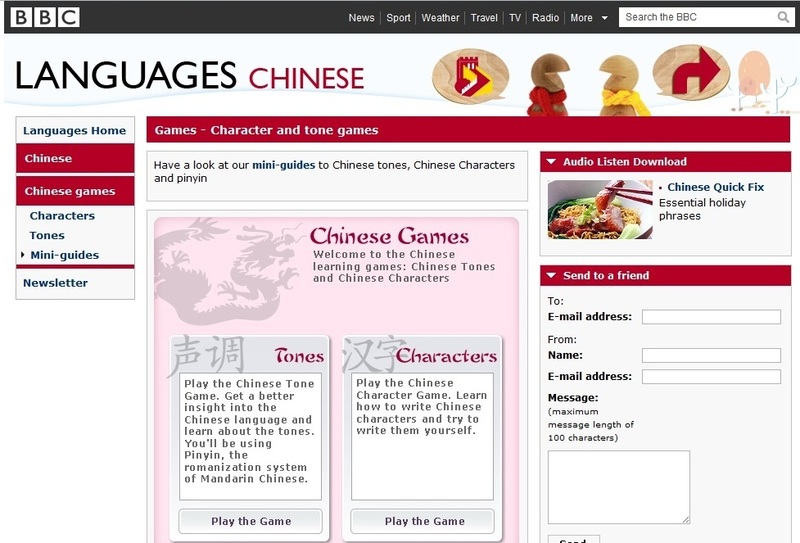 I’m a big promoter of the BBC’s offerings for English learning, but they also have good sites for other languages. 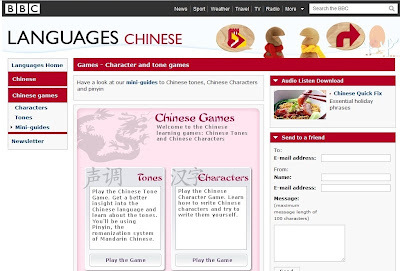 The Chinese learning site isn’t very extensive but it does have a good variety of activities and articles, including games for tones and characters, sample dialogues, cultural information, and language guides. It would be interesting even for people who are just curious about the language, but don’t necessarily want or need to learn it. Angela recommended this site after using it to practice some of her new German vocabulary. 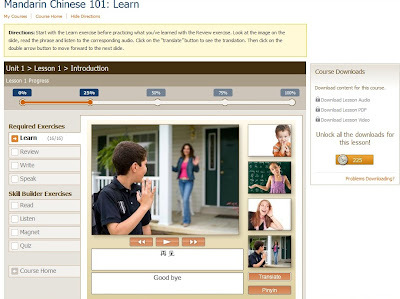 I think it’s good, but it may a bit difficult for Mandarin language beginners to use. All the language courses on the site start off the same way, introducing basic phrases like “Good Morning” or “I don’t feel well.” That’s OK for a non-tonal language that uses the Roman alphabet (like English, German, French, etc. ), but for Chinese it’s a bit difficult to just jump into it, without even mentioning tones or the writing system at the beginning. It can be good to listen to and identify vocabulary, but it’s a bit lacking in terms of additional information. I also downloaded a few programs and Chinese learning games to my iPod touch. If any of them turn out to be useful, I’ll be sure to mention them here. Thanks for reading, and if you have any comments, suggestions, or language tips, please leave a comment below. Have a great day!